Former Sen. John Edwards (D-NC) confessed last summer to having an affair with Hunter. Friends of Hunter's said at that time that Edwards was the baby's father. "I've seen the pictures of the baby she looks like John Edwards. 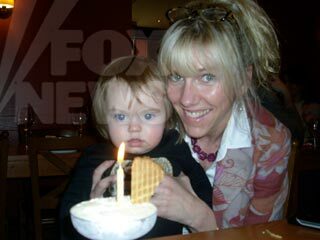 She's got his eyes and jaw line and lips, but she does have Rielle's nose," Hunter's sister Roxanne Druck said. While Edwards expressed his willingness to take a paternity test, Hunter has refused. "Rielle will not participate in DNA testing or any other invasion of her or her daughter's privacy now or in the future," a lawyer said in August.